Entirely self taught, and employing a primitive style of painting, Edward Hicks matured from a sign painter into one of the most significant American folk artists. He was born in 1780 in what is now Langhorne, Pennsylvania. Orphaned at age three, Hicks was apprenticed to a carriage maker and began to paint. He decorated coaches, tavern signs, tables, chairs, firebacks, fire buckets and chests. While he is most famous as a Quaker preacher during his lifetime, today Hicks is primarily remembered as a painter. His subjects were portraits of family farms, and historical and religious scenes. His favorite subject, and the one he is most famous for, is the Peaceable Kingdom. 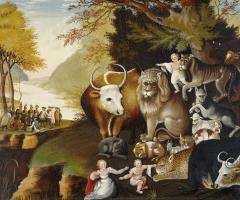 He painted more than a 100 versions of this theme, illustrating the passage from chapter 11 of the Book of Isaiah: " The wolf also shall dwell with the lamb, and the leopard shall lie down with the kid; and the calf and the young lion and the fatling together; and a little child shall lead them." To Hicks, this modern historical event embodied Isaiah's prophecy of peace between opposing groups. Like many others, he believed that America was the realization of the promised land of the Bible.